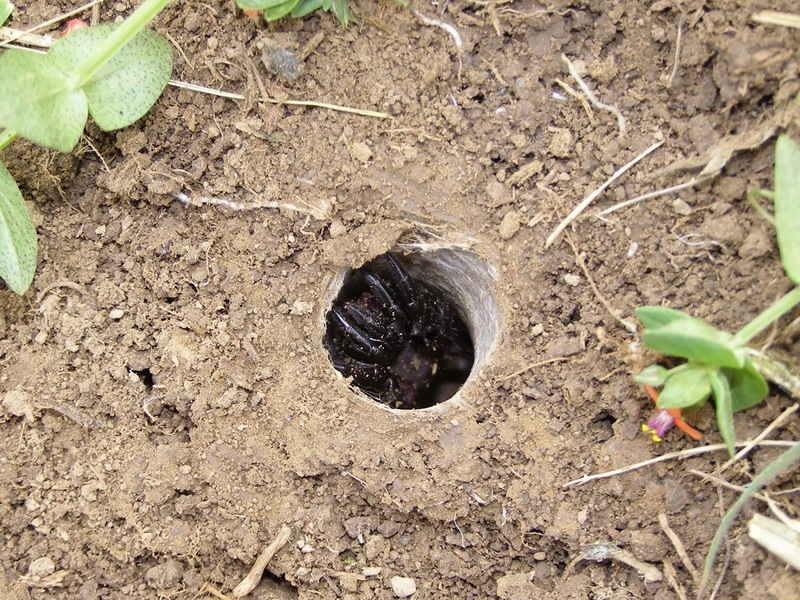 In 2009 I found an abandoned burrow of a Trapdoor Spider. 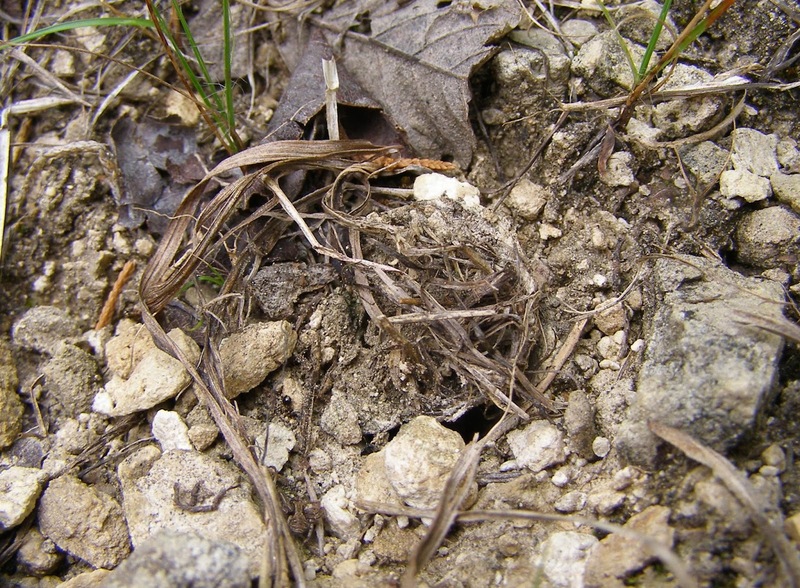 That light colored lump to the left is actually a silken cap that can be pulled snug down to close the burrow entrance. 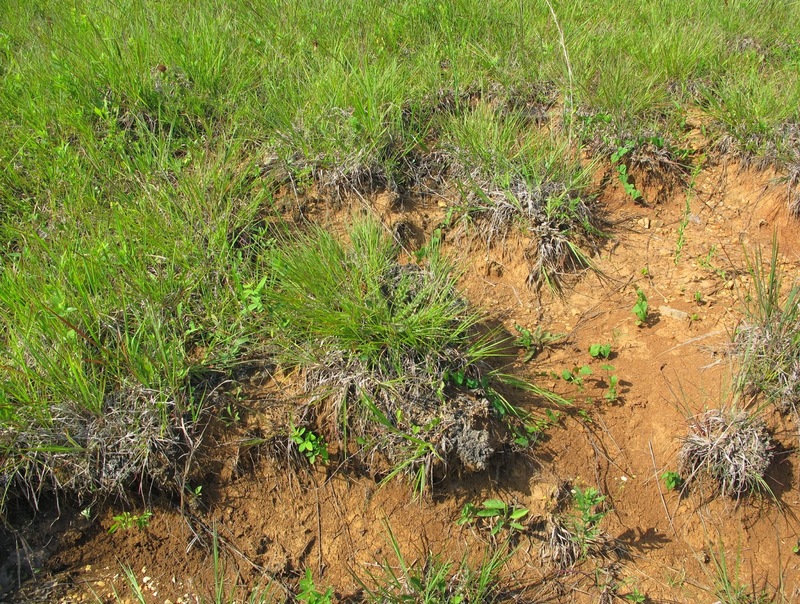 When closed, the camouflaged cap makes the burrow nearly undetectable. 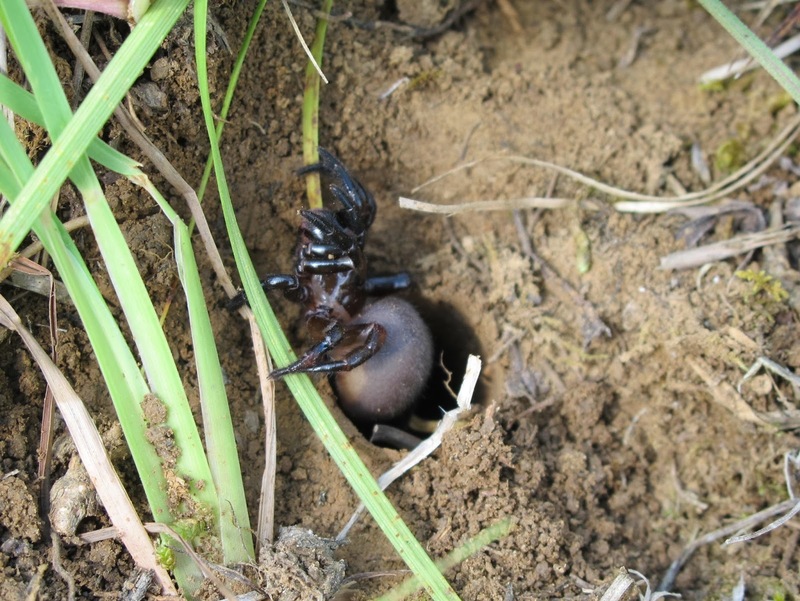 The Trapdoor Spider hunts by lunging out from beneath the cap to grab passing prey and then pulling the catch into the burrow for consumption. I have always wanted to witness this spider in action. 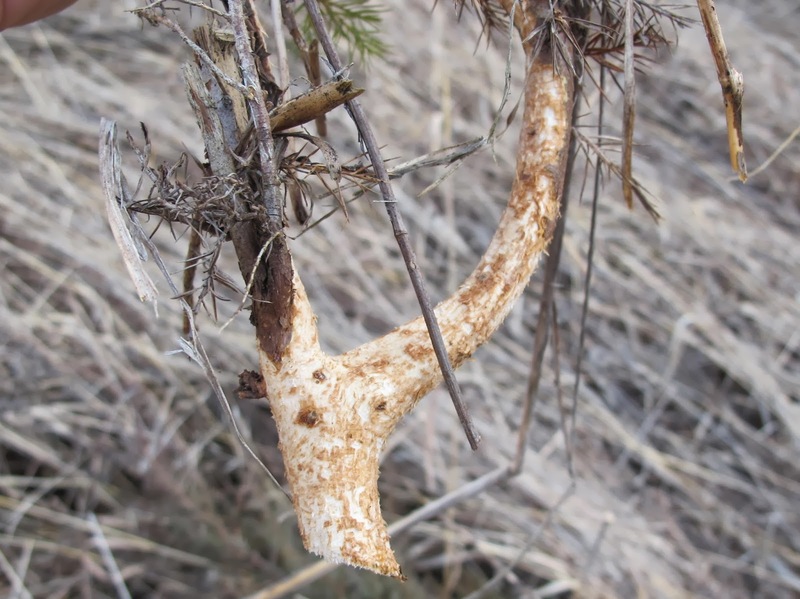 Having found evidence that the spider lived at Blue Jay Barrens, I was keen to find the living animal. 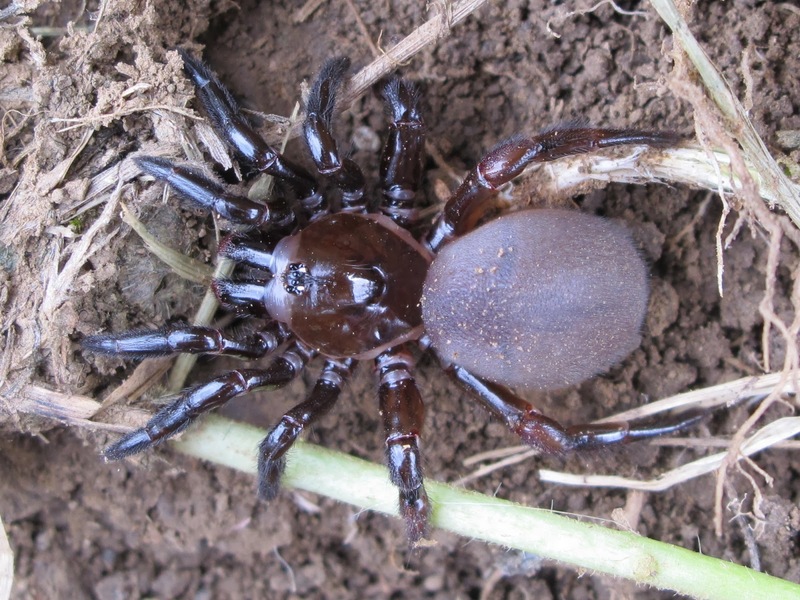 My first encounter with a live Trapdoor Spider occurred by accident on July 1, 2013. I inadvertently sliced the top from a burrow while hoeing weeds in the vegetable garden. 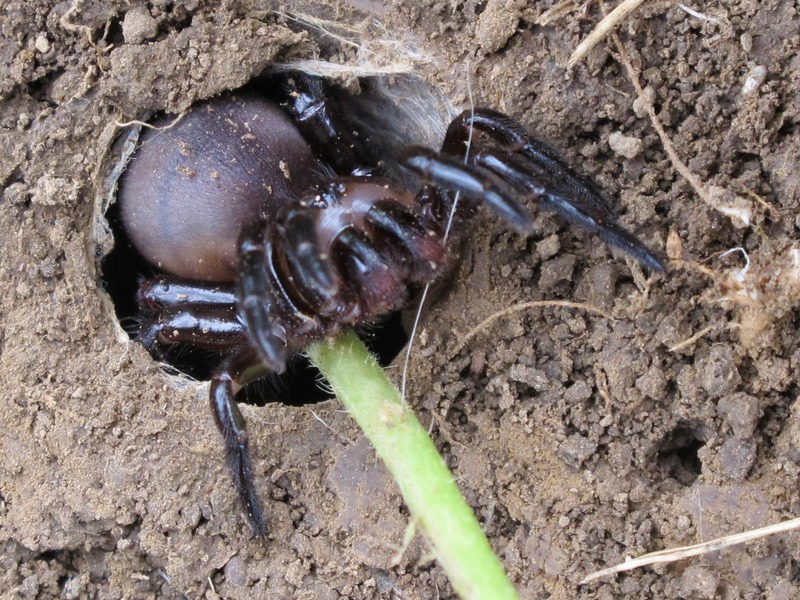 Trapdoor Spiders cover the sides of the burrow with a thick layer of silk and this was the first thing I noticed when the burrow was uncovered. My excitement level rose quickly when I saw the spider inside. I used a weed stem to encourage the spider from the burrow. It crawled right out with no display of aggression. This is one neat looking spider. It presents an odd appearance because it seems to have ten legs instead of eight. In this photo the spider is facing to the left. 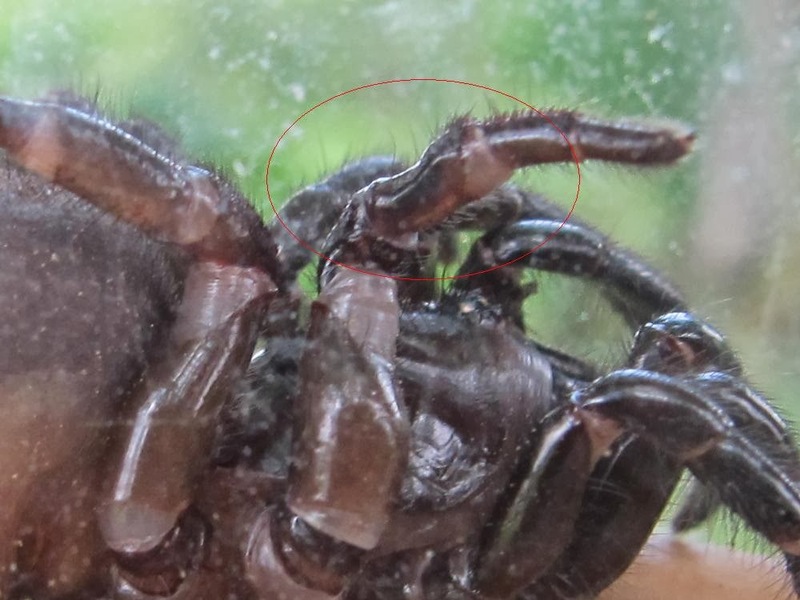 The two short projections are the chelicerae or jaws which terminate in fangs. 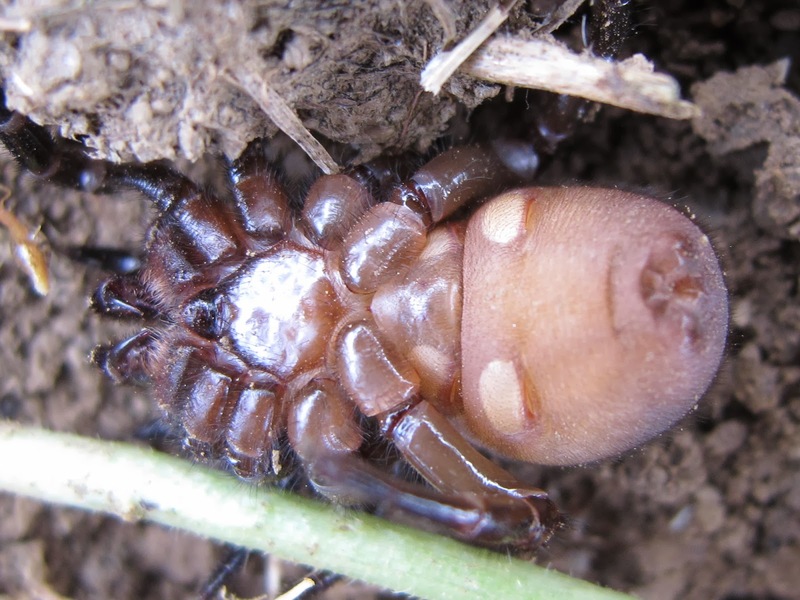 Beside those, looking much like a first set of legs, are the pedipalps which seem to play a part in the mating process. The first real legs are found just behind the pedipalps. The shape of the carapace covering head and thorax gives the spider a distinctly crab like appearance. In order to capture features that may aid in identification, I took shots of the spider from as many angles as possible. My most useful identification guide, Spiders of North America – an Identification Manual by Ubick et.al., often requires magnified examination of specific spider parts that are obtained by dissecting a non-living specimen. I had no intention of sacrificing this individual, so I was hoping for the best with my photos. Fortunately, I was able to get some positive shots of a characteristic depression in the tibia of the third leg which identified this as a member of the genus Ummidia. 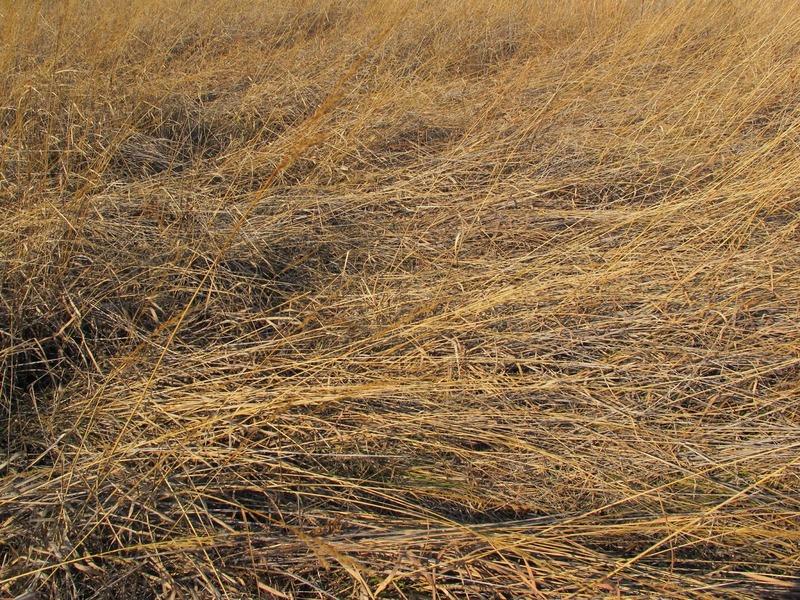 The keys in the manual ended at genus with a note that it was widespread in the U.S., being represented by 50 species, only 10 of which have been described. 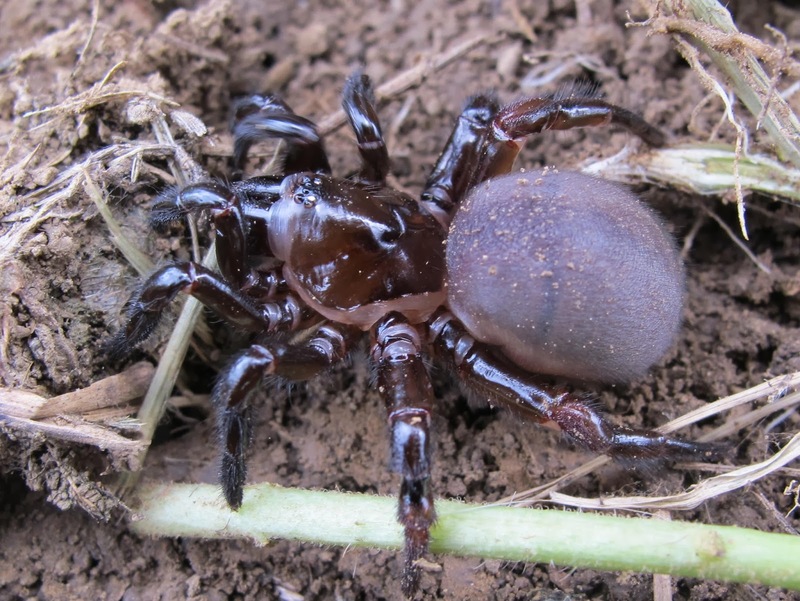 Like a well trained dog, the spider rolled onto its back for some shots of the ventral surface. The fangs can be seen to the left. The light patches on the abdomen are coverings over the lungs. Air enters the lung chamber by way of spiracles accessed through slits at the edge of the cover. It wasn’t safe for the spider to remain in the garden, so I chose the nearest barren with suitable soil conditions as a relocation site. 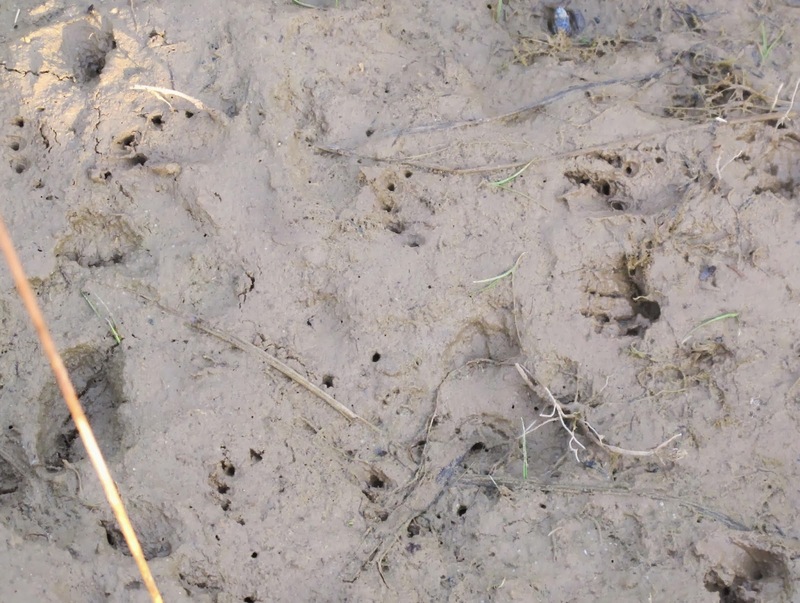 This area is very similar to that in which I found the 2009 burrow. 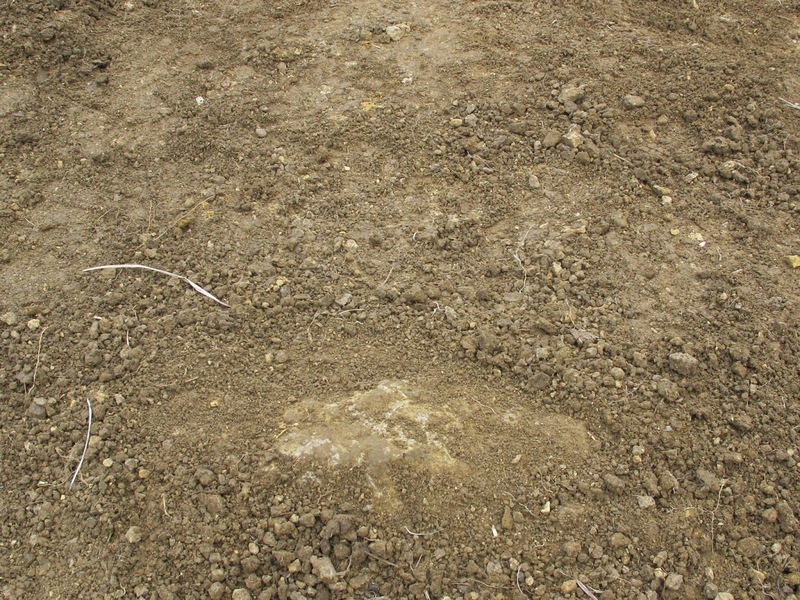 I fashioned a new burrow by stabbing my finger into the ground and firming the soil near the surface. The spider wasted no time backing its way into its new home. I checked back a couple of weeks later to see how things were going. 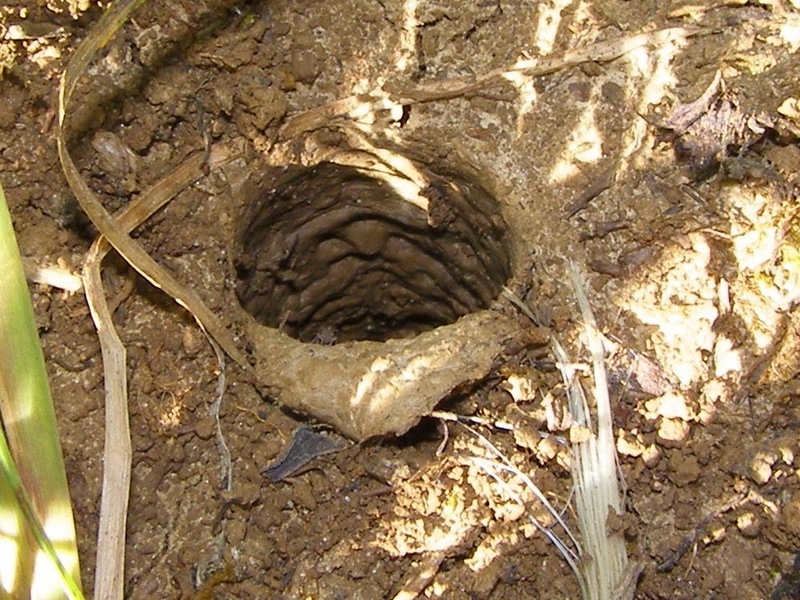 The inside of the burrow had definitely been reshaped and the outside edge had been reinforced by spider silk. Unfortunately, there was no sign of the spider. 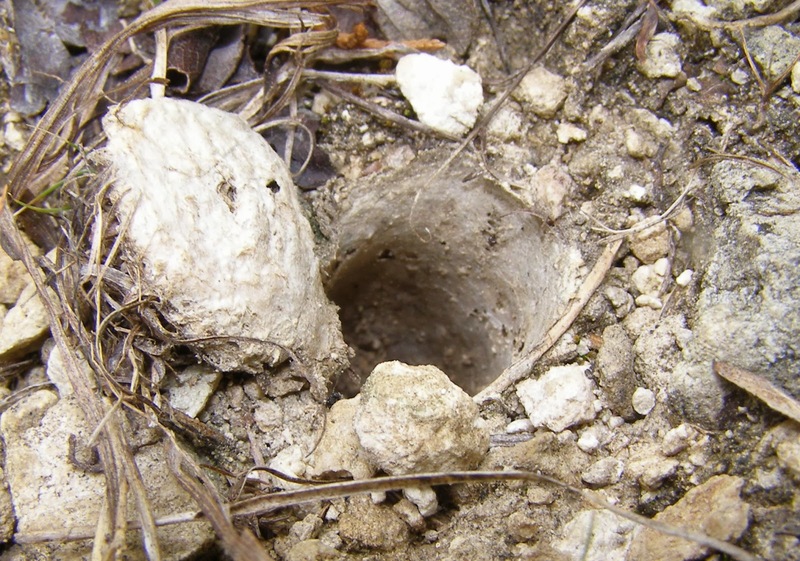 Hopefully, the spider found a more suitable location for a dwelling and dug its own burrow. 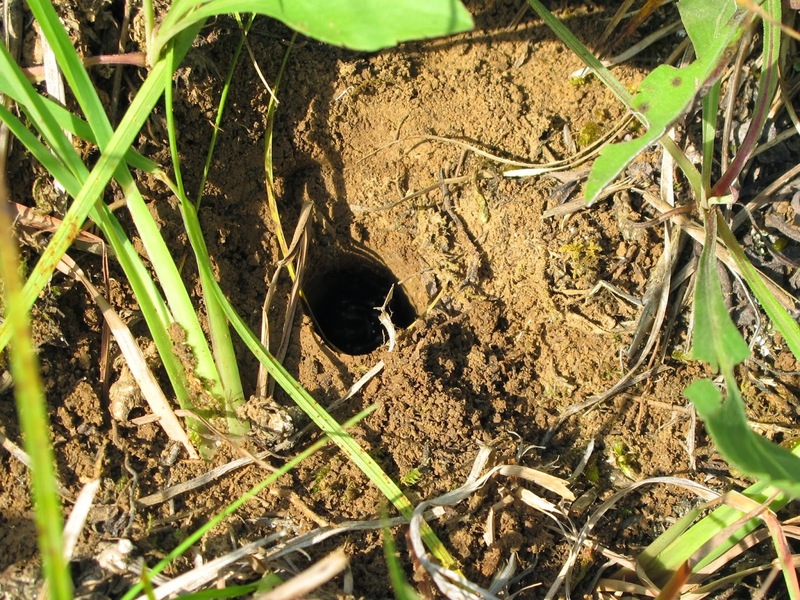 I’m happy to have seen the live spider, but I’m still determined to see an occupied burrow in action. 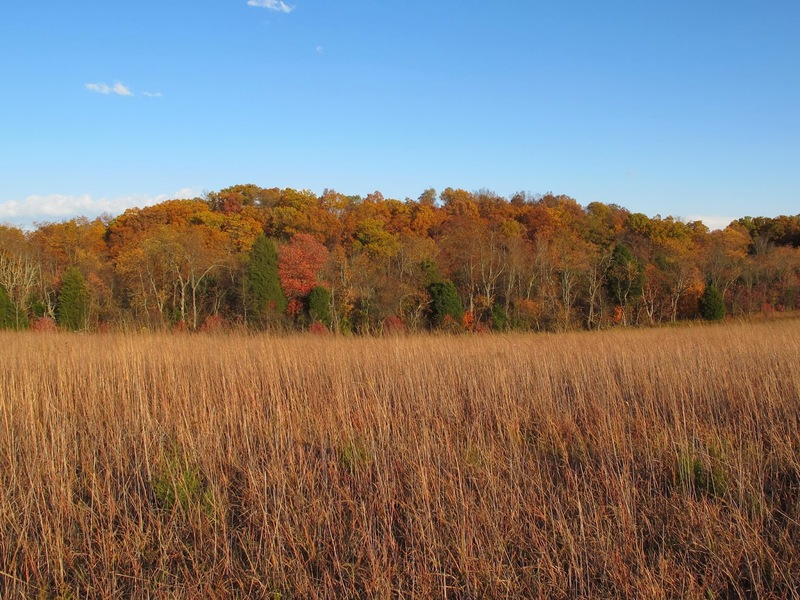 Management of natural biological systems begins with an effort to set ecological conditions at a point that will allow for a natural progression toward a desired end. Once that point is reached, maintenance is required to remove obstacles that would slow progress toward the planned outcome. 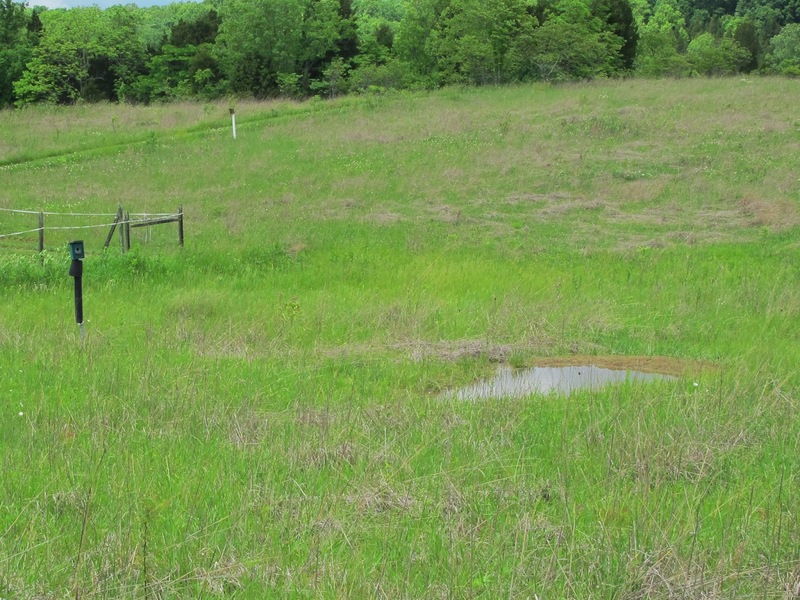 Many areas at Blue Jay Barrens are managed for the development of healthy grassland or prairie ecosystems and are doing quite nicely. 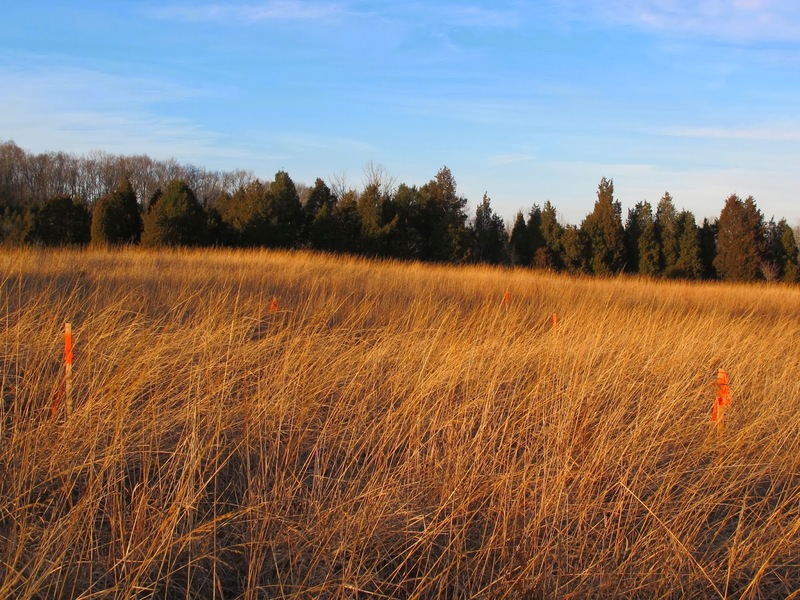 The major threat to their continued development is crowding and shading by invading Eastern Red Cedar. Young cedars develop quickly. At an age of about 5 years they become large enough to begin producing a dead zone in the shade of their thick foliage. 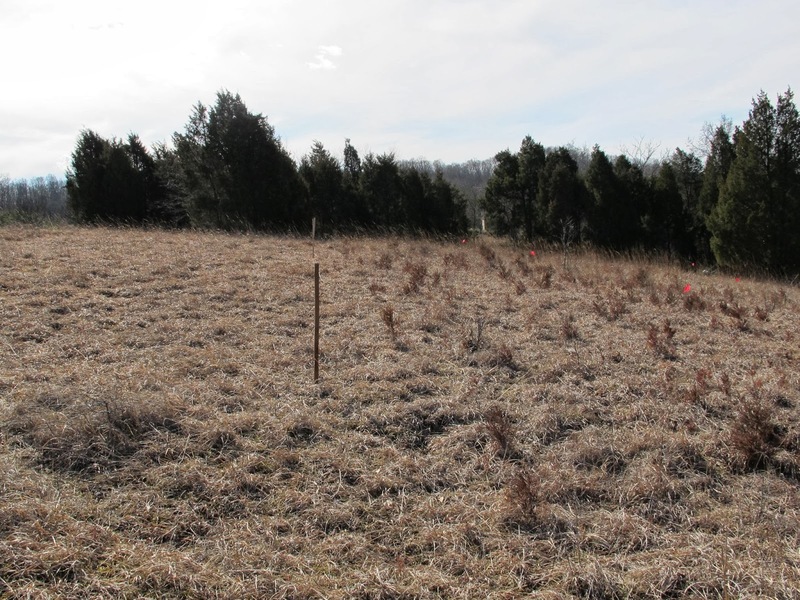 In order to avoid negative impacts, the cedars must be sought out and removed. 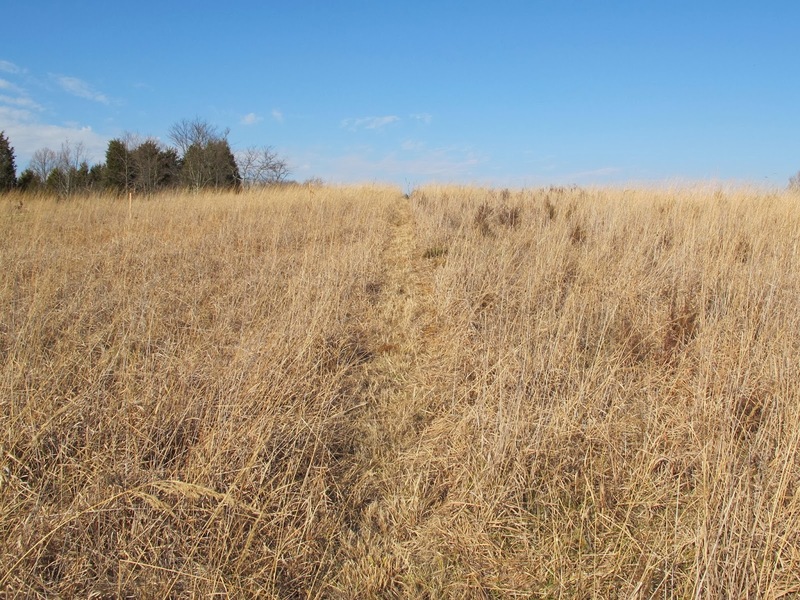 The hunt for young cedars becomes more difficult in tall grass, especially when that grass has been laid over by heavy snow and strong winds. The search may be a challenge, but dealing with the cedar is easy. Cutting the cedar off at ground level is all it takes to be rid of the pest. As long as there are no green branches left on the stump, the cedar will not regrow. I give each cedar a flip to make sure it has been properly cut. Reaching down with long handled pruners results in a diagonal cut that can sometimes leave shallow growing roots still attached to the tree top. A tree left in this condition will continue to grow. 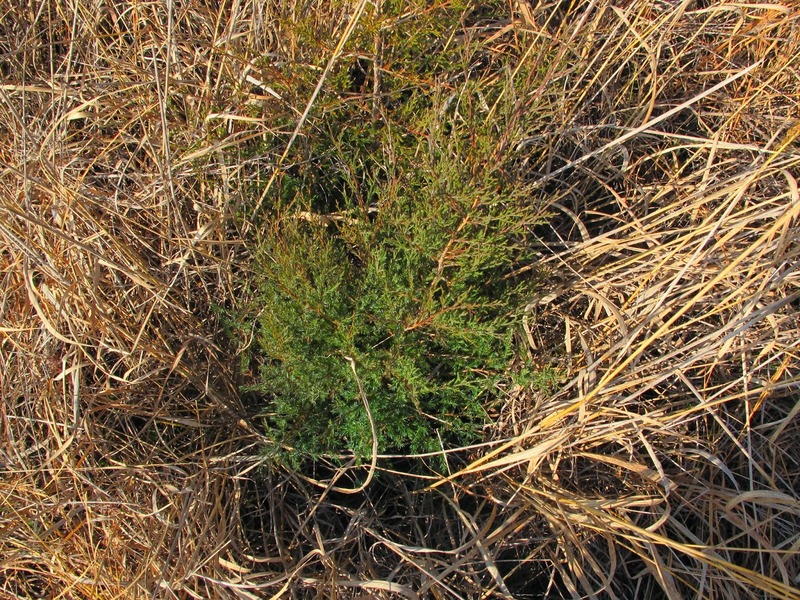 Young cedars typically don’t suffer much damage from predators. 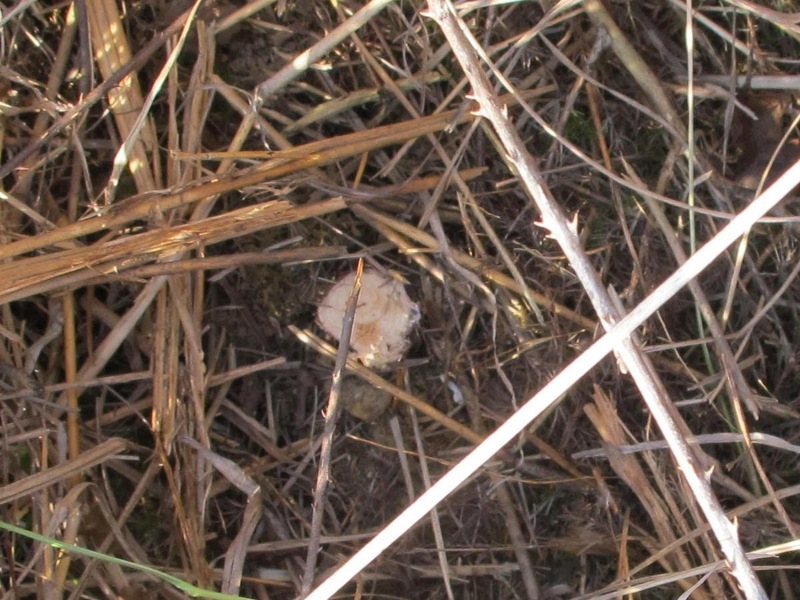 In one area of the field I found about 30 plants that appeared to have had their bark removed by a hungry vole. I’m guessing that many of these debarked cedars would die. 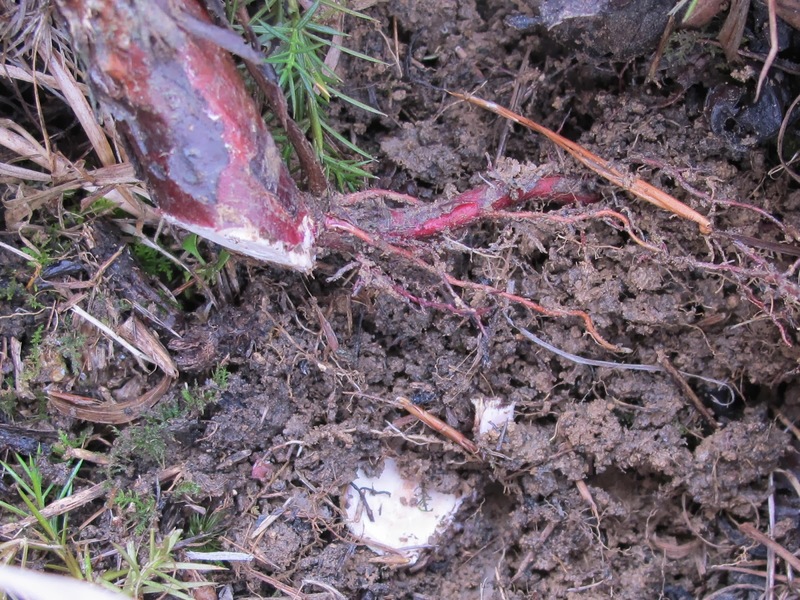 Maybe this vole will pass on its appetite for cedars to its offspring. 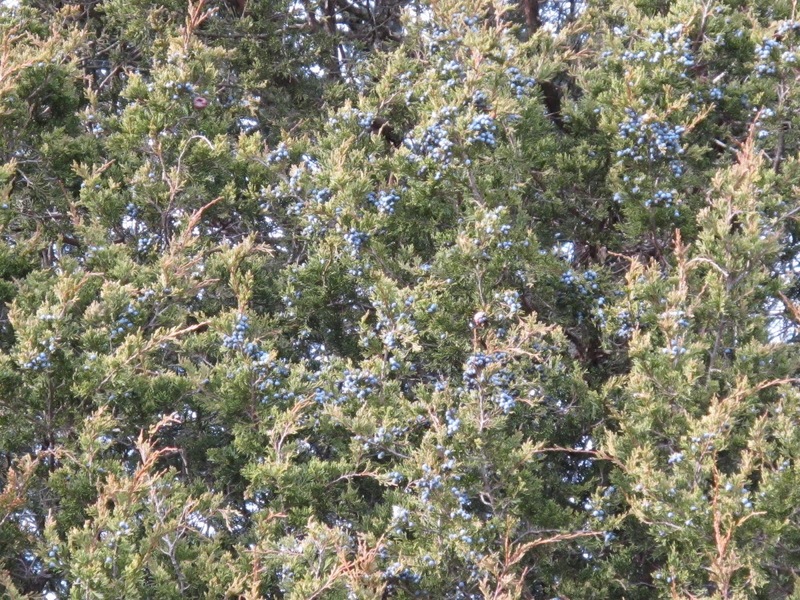 Invading plants come from seeds left by birds feeding on the berry-like cones of mature Eastern Red Cedar. The bird’s intestinal juices weaken the seed coat and allow for easy germination. Birds that feed from the cedars and also spend time foraging in the open fields, such as Starlings and Robins, spread the seeds with their droppings. 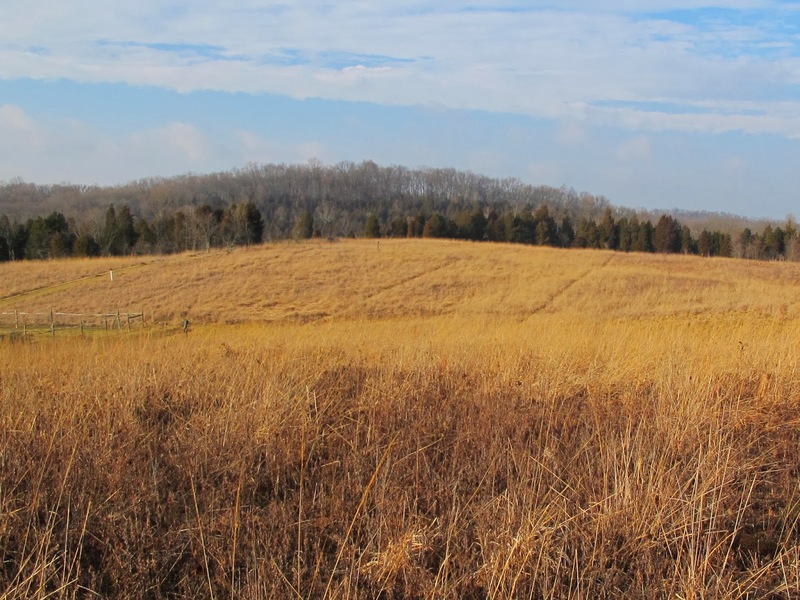 Seed drop is particularly prevalent along the power line right-of-way. Birds perch on the wires after feeding and drop an enormous load of seeds. My long handled pruners add perspective to this shot of young cedars crowded beneath the electric line. 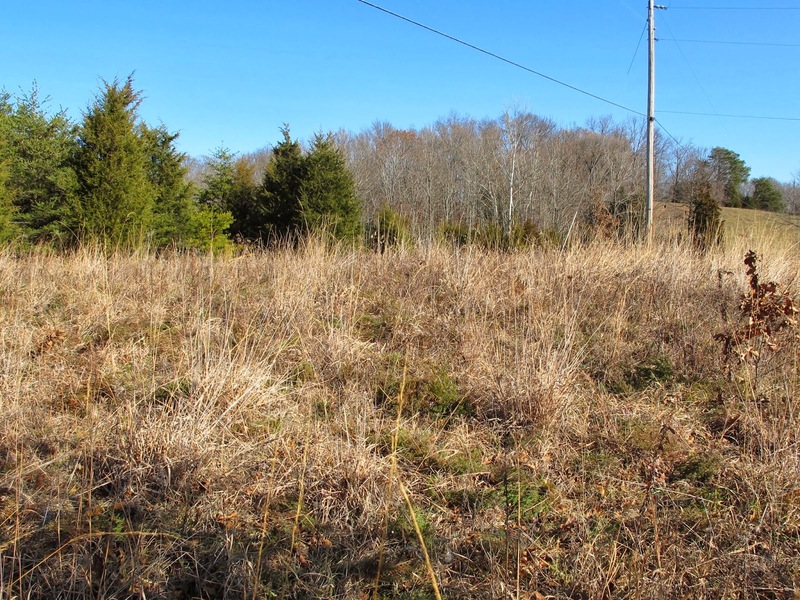 Working in areas like this can be awfully frustrating as you cut cedars one-by-one from a seemingly endless thicket of small shrubs. 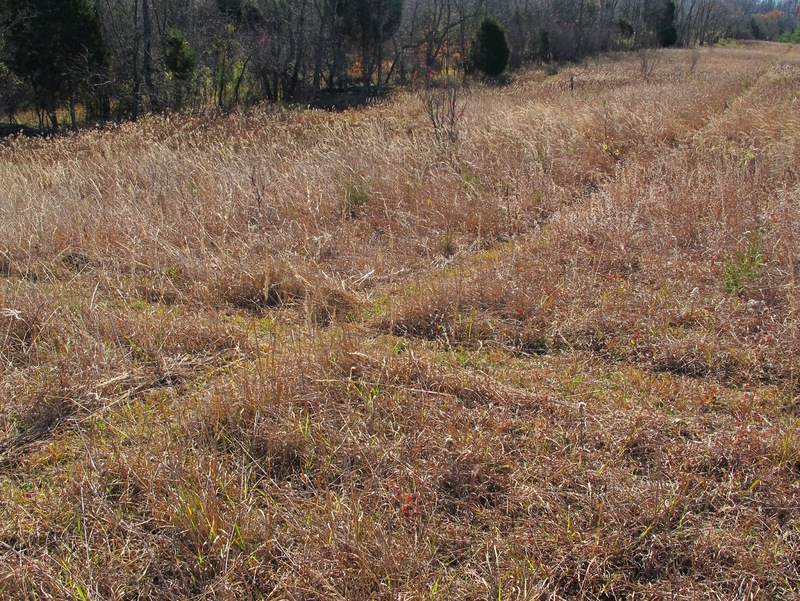 In order to organize my search pattern through the field, I use my brush mower to create a grid pattern. This way I can work one block at a time and reduce the risk of missing a part of the field. Grid boundaries are marked by several permanent structures, so it is easy to recreate the same pattern. Reproducing the placement of grid lines allows me to compare notes of current cedar density and other conditions for each block with earlier maintenance activities. Within each block, I use brightly marked stakes to guide my search. Two lines of stakes are used. The line on the trailing edge is moved forward as I complete my search of each section. 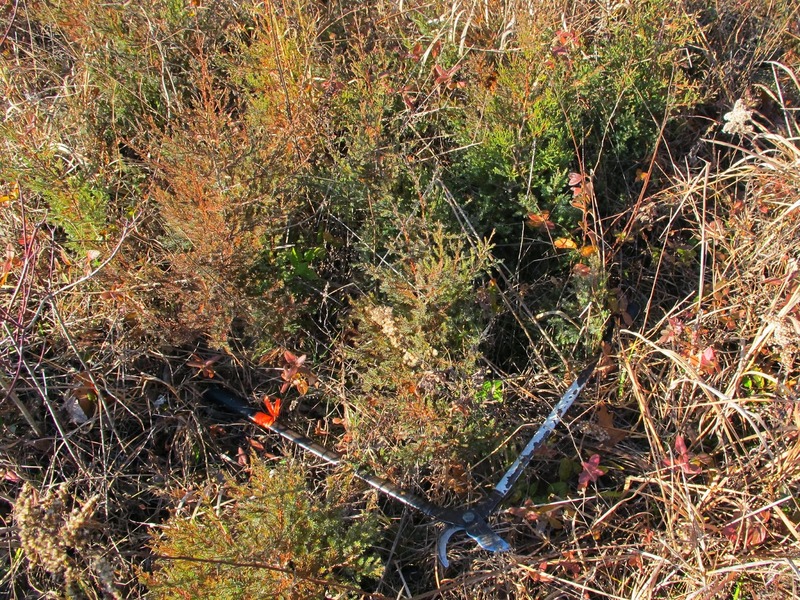 Width of my search corridor depends on the thickness of the vegetation and the difficulty in seeing the small cedars. 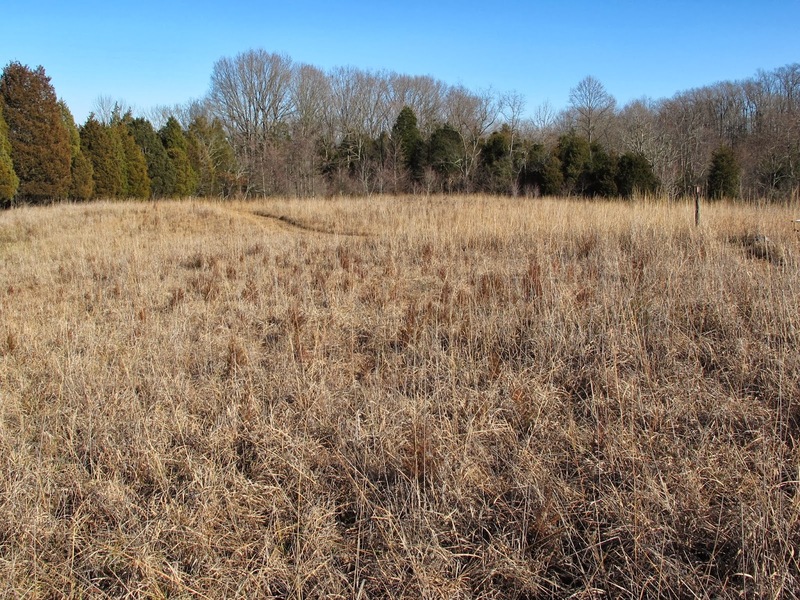 In some cases I will leave the cut cedars to decompose in the field. At other times I’ll remove them to one of the brush piles. 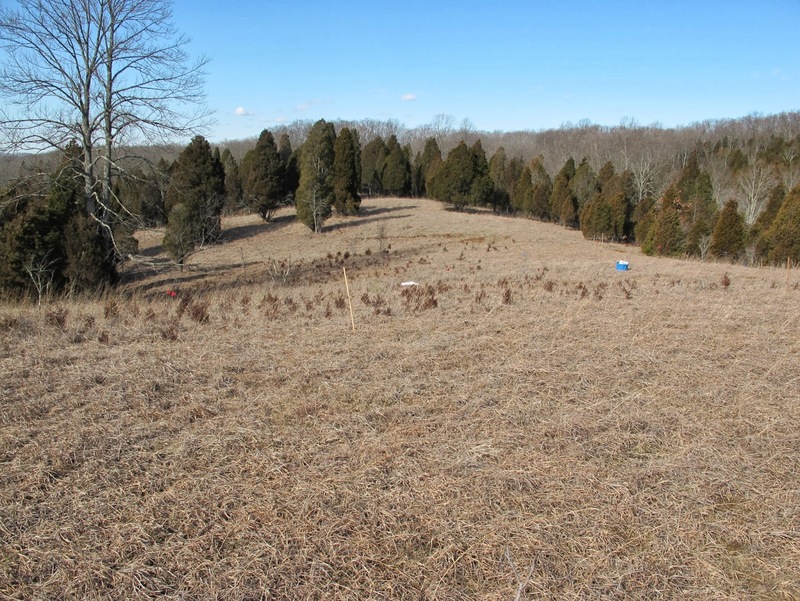 The quantity of cedars looks much greater when it’s brought into the open and concentrated in one area. The completed area on the left looks much cleaner than the uncut portion on the right. Utilizing the grid pattern also gives a sense of accomplishment as each block is completed. During the winter of 2013 I spent just over 120 hours completing cedar maintenance on 19.3 acres. This sets my pace at a little more than 6 hours per acre. Short grass areas are easier to work. Instead of cutting a grid pattern, I use stakes to create a base line. 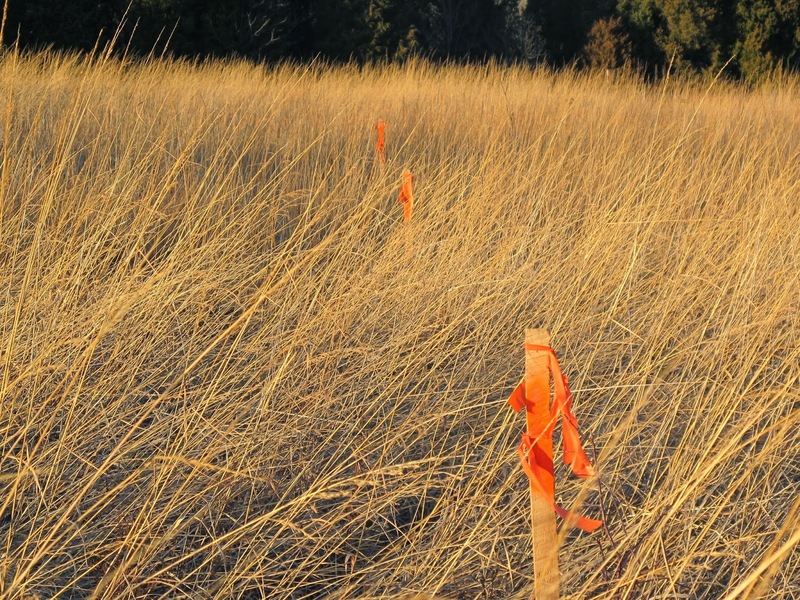 Rows of flags mark the boundaries between search corridors. Short grass makes the cedars more visible, so I’m typically cutting smaller plants. 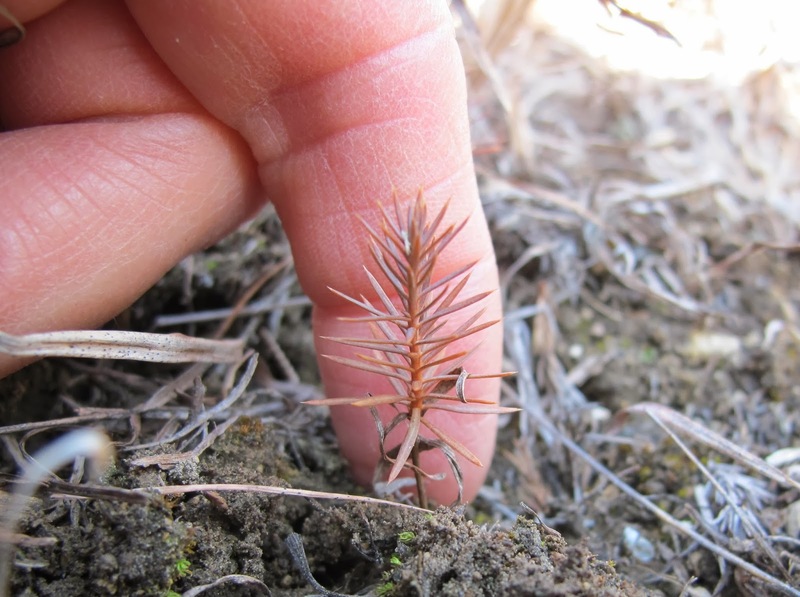 I’ll cut every cedar I can see, even if it’s only a finger sized seedling. I like to occasionally stop and admire the completed work. Cut cedars are put into the blue tub. Filled tubs are placed on the white sheet. Four tubs fill the sheet which is gathered by the corners and slung Santa style over my shoulder for the trip to the brush pile. 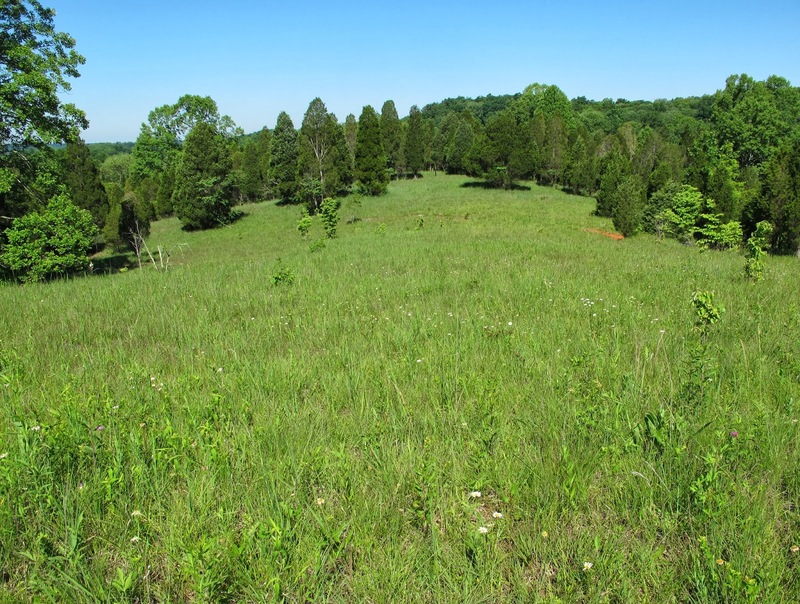 My favorite part of the job is watching the cedar-free prairie green up in late spring. I enjoy the work, but I’m glad it’s just a seasonal activity. 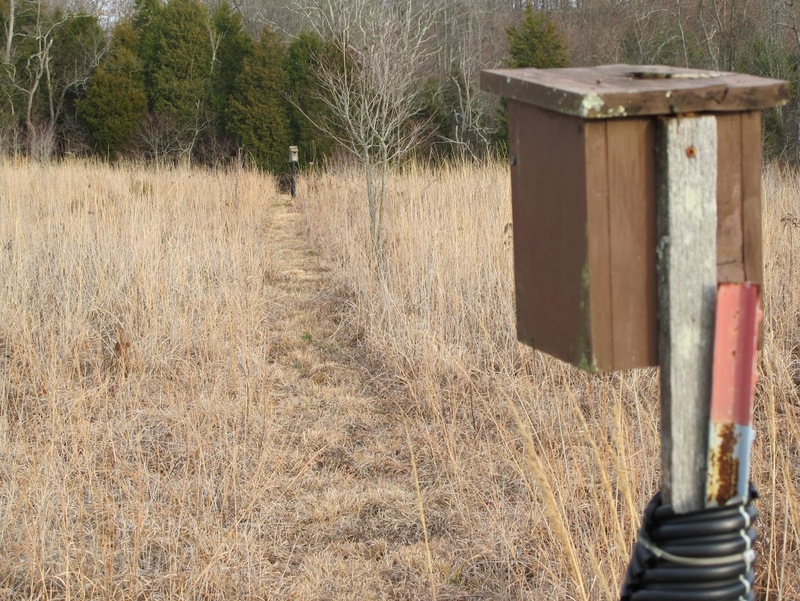 In October 2012, I began a project designed to increase the toad population at Blue Jay Barrens. Toads were once common visitors to the pond during the spring breeding season. I still hear their mating calls at a distance, but it has been several years since they have been on this property. Besides missing the toads, I am concerned about the population local Hognose Snakes which feed heavily on toads. 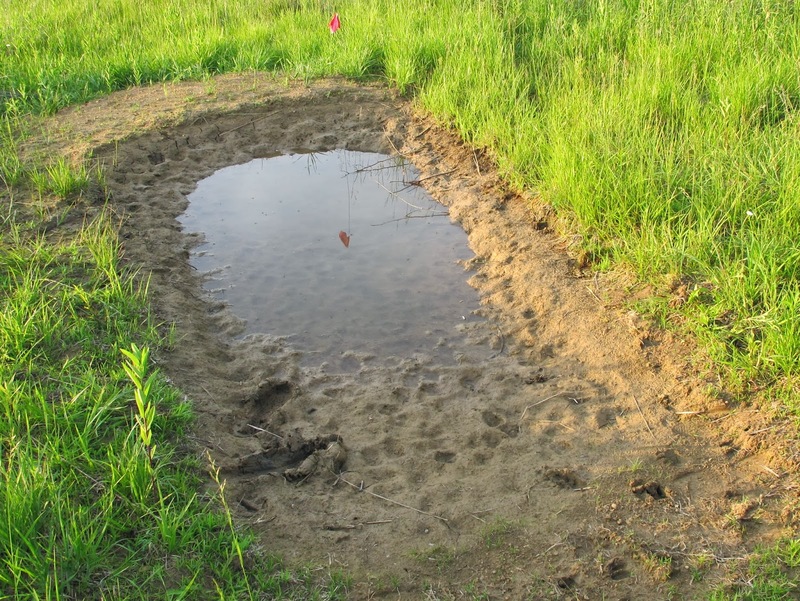 I believe that additional suitable breeding sites will help the toad population to rebound, so I am constructing a series of small temporary pools to serve that purpose. This is the start of the first pool. My working tools are a roto-tiller and a scoop shovel. 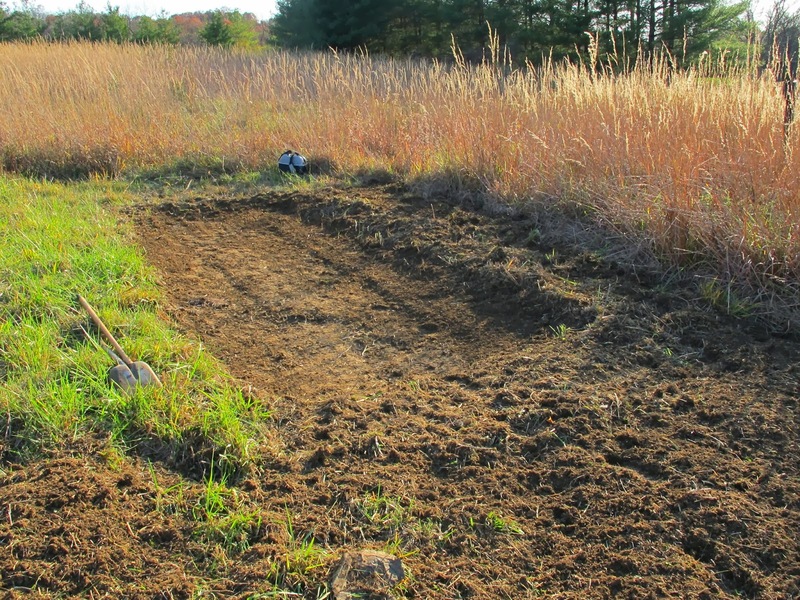 Tilled soil is scooped up and moved to its new location. In this pool, excavation stopped just atop the bedrock. I finished work minutes ahead of the rain and the pool quickly filled. The local White-tail Deer population was quick to claim this as a preferred watering site. 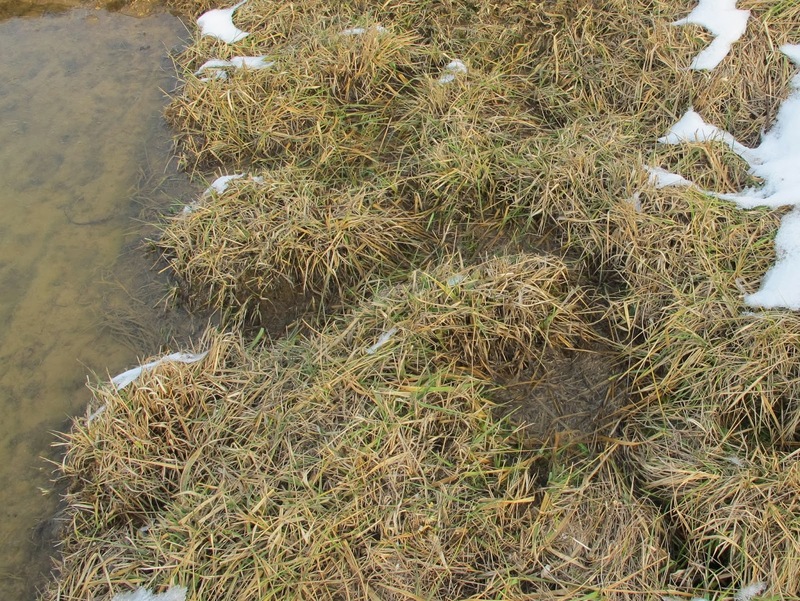 Soil that was used to form a shallow dam at the low end of the pool suffered severe trampling. 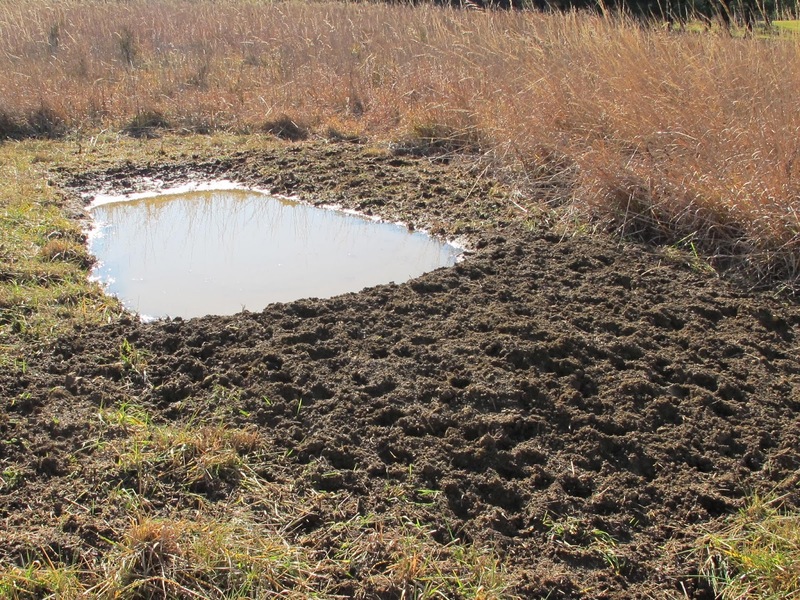 The deer had the area looking much like a confined livestock area. 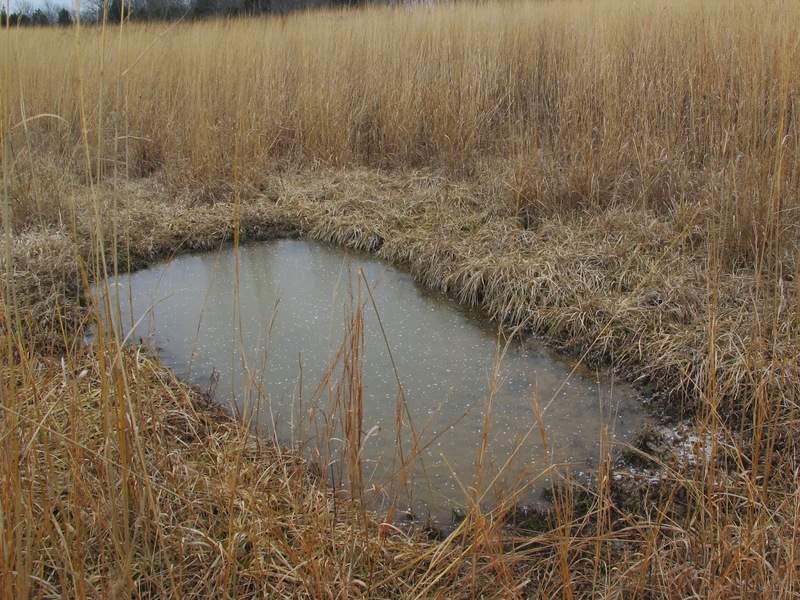 The pool was constructed in an area primarily consisting of Tall Fescue, a non-native grass considered to be invasive in areas of native vegetation. 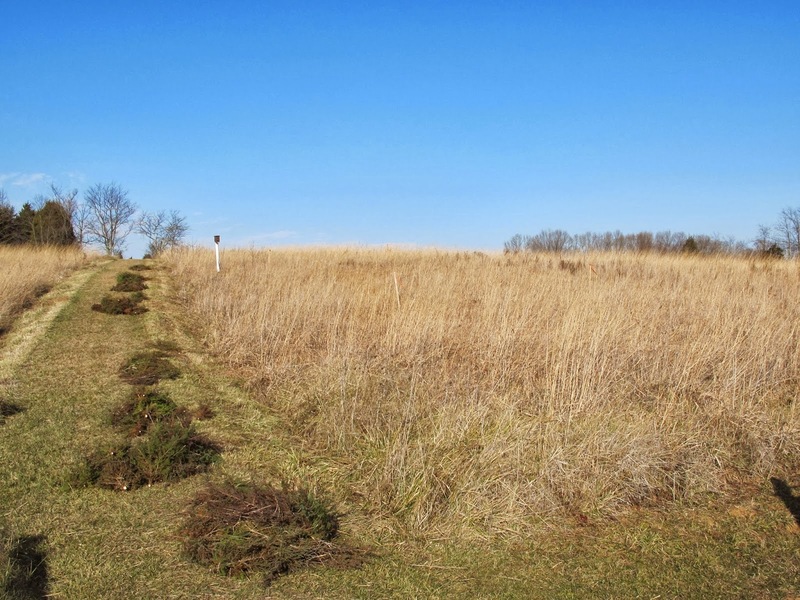 Elimination of the fescue was a primary consideration in choosing this particular site. The second consideration was the presence of this seasonal spring located just above the pool site. 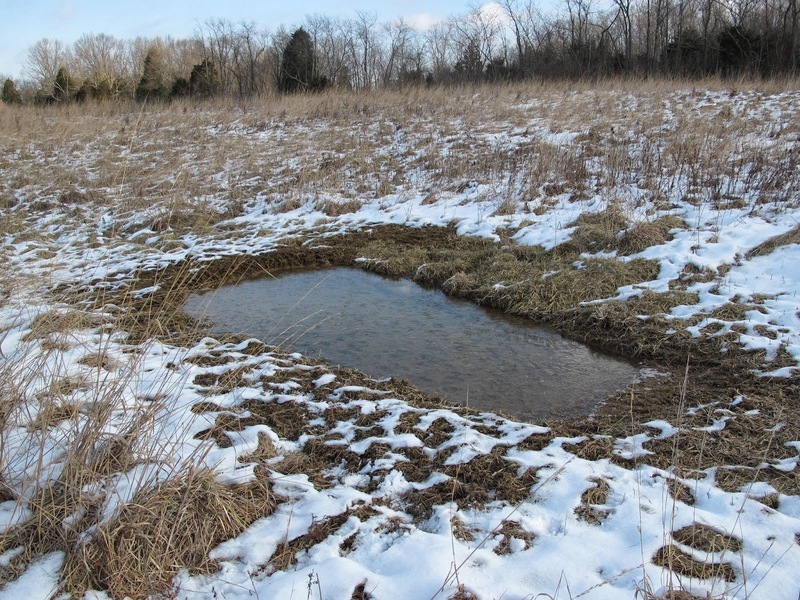 My hope was that this spring would produce a strong enough flow to keep the pool full of water. 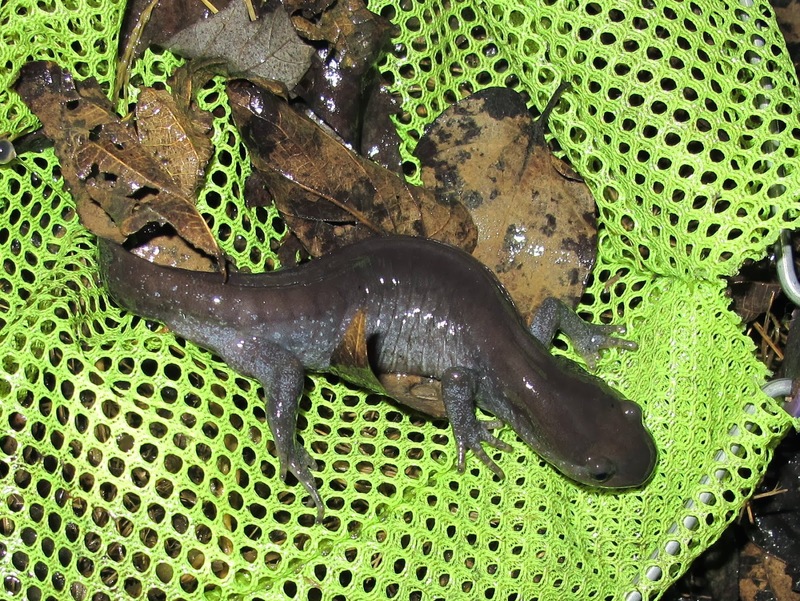 In January 2013, Jefferson Salamanders returned to the pond for their annual breeding activities. I had hopes that the toad pool would also support the local salamander population, but knew it was unlikely that any salamanders would appear there the first year. I was right. The pool remained empty. Salamander breeding in the pond was highly successful. Dozens of egg clusters clung to the submerged tree branches. 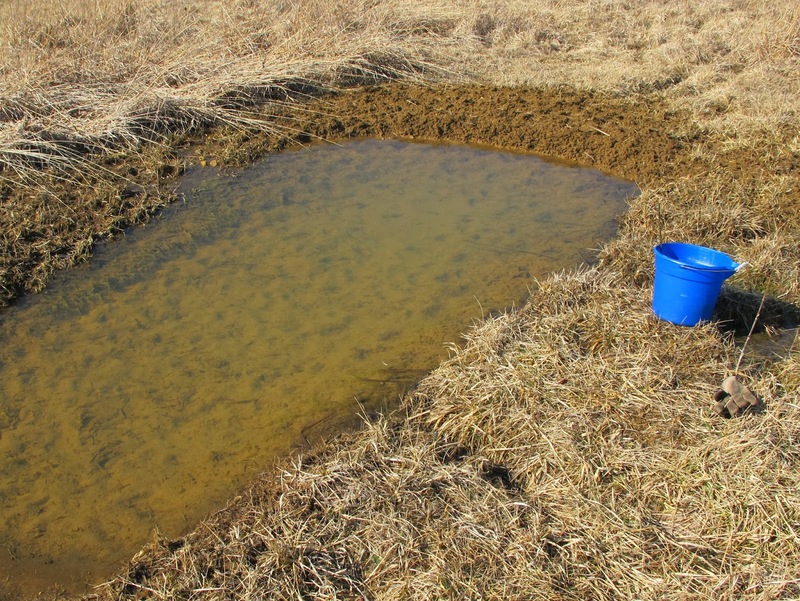 Mild temperatures in February brought out several species of aquatic insects that filled the toad pool with eggs. Since I was going to be making frequent visits to the toad pool through the coming year, I wanted to make sure there would be some interesting things to see. I thought the insect larvae developing in the pool might support salamander larvae, so I moved a couple of salamander egg clusters from pond to pool. These five week old eggs are showing well developed salamander larvae. The stick holding the egg clusters was secured to the pool side so the eggs were suspended in the mid level of the water column. I was curious to see if the newly constructed pool would be able to satisfy the needs of the developing larvae. 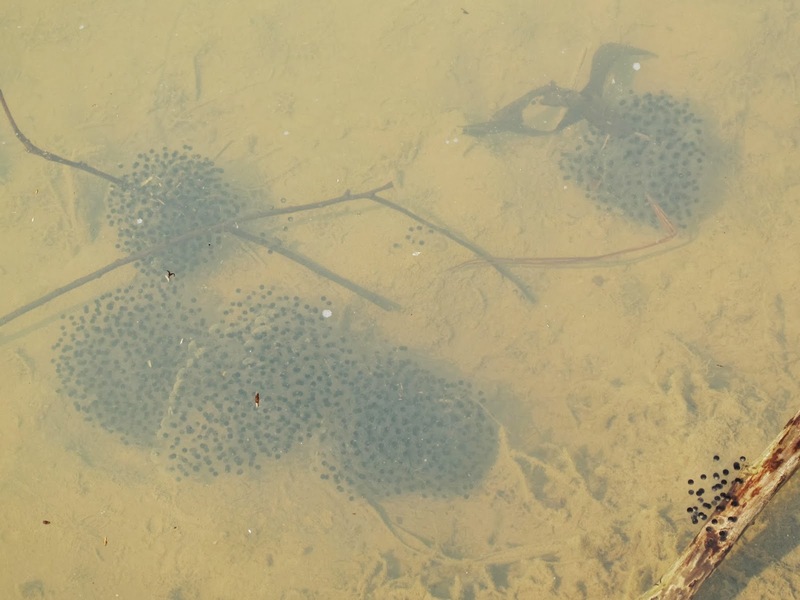 Wood Frogs were actively breeding in the pond, so I moved a few of their egg clusters into the pool. Salamander larvae wriggled free of their jelly-like egg masses in late March. 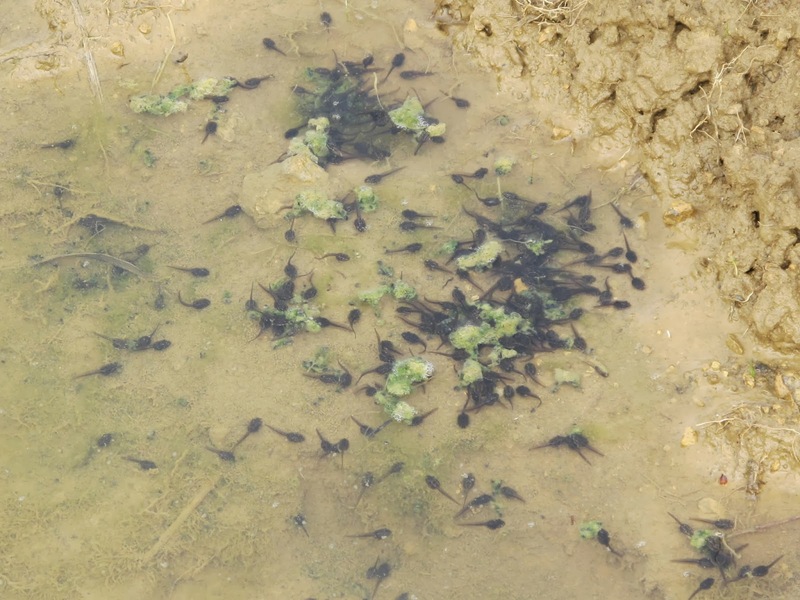 Wood Frog tadpoles, looking more like small leeches than amphibians, fell from their eggs on April 1 and spent several days lying on the pool bottom before becoming free swimming. 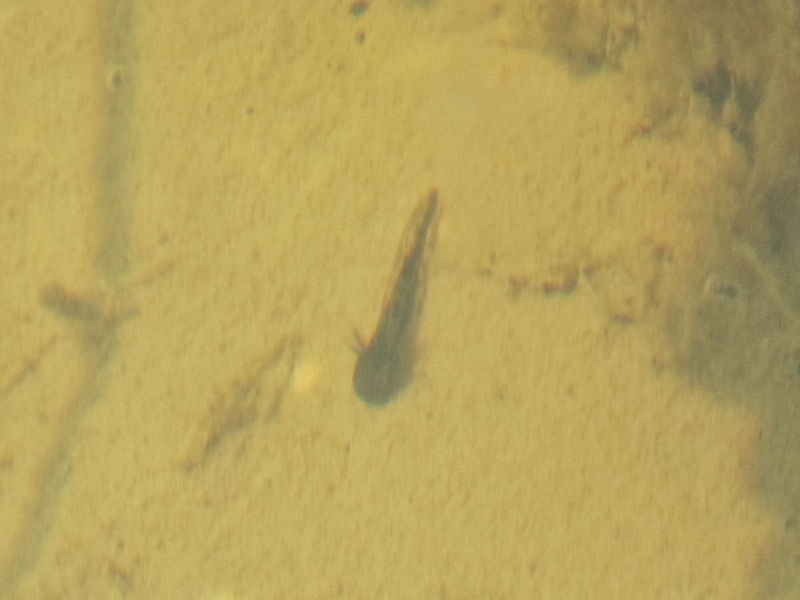 I witnessed one salamander larva making a meal of a newly hatched tadpole. 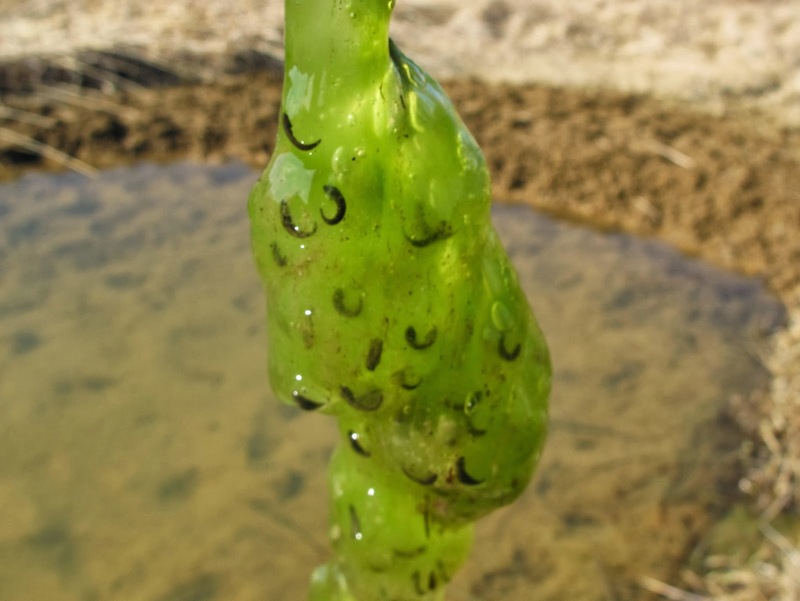 The Wood Frog tadpoles developed quickly and within two weeks were aggressively consuming algae in the pool. Below normal rainfall in May was cause for concern. This shot on May 23 shows the pool still full of water. Had the spring not stopped flowing a week earlier, I would have been confident of the pool’s ability to hold water long enough for the salamanders and frogs to complete their metamorphosis and move away from the water. 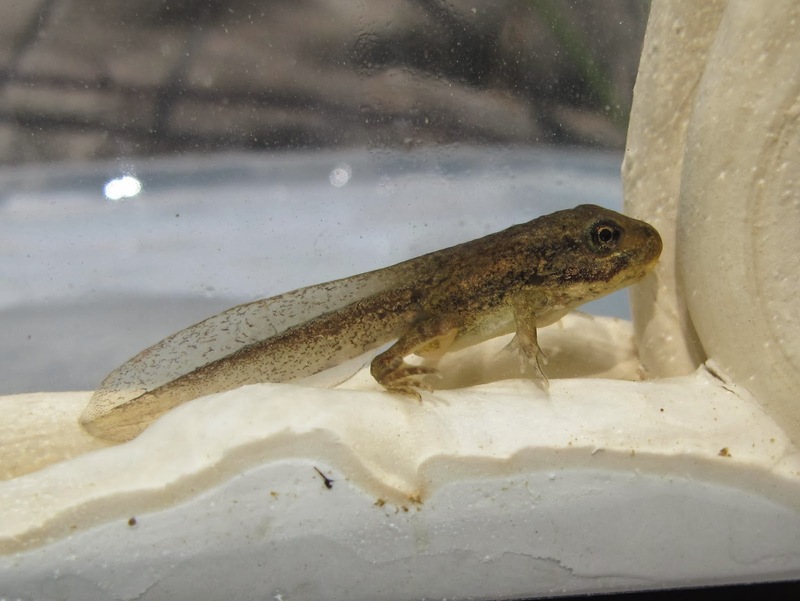 A check of the salamander larvae on May 24 showed them to be in good health and vigor. This individual illustrates the average stage of development and is about two weeks from leaving the water. 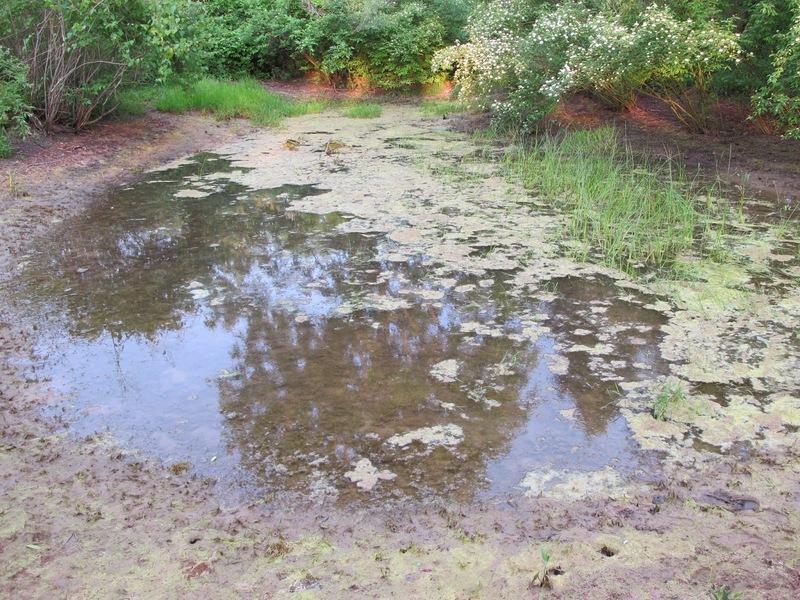 A few more rapidly developing larvae had already moved out of the water to hide beneath wet vegetation at the pool’s edge. Wood Frogs were also well advanced and would be leaving the water soon. Several had already moved away from the pool. By May 30 the pool was in danger of disappearing. Had there been a normal precipitation pattern, the pool would have remained full plenty long enough for the amphibian larvae to leave the water before it left them. 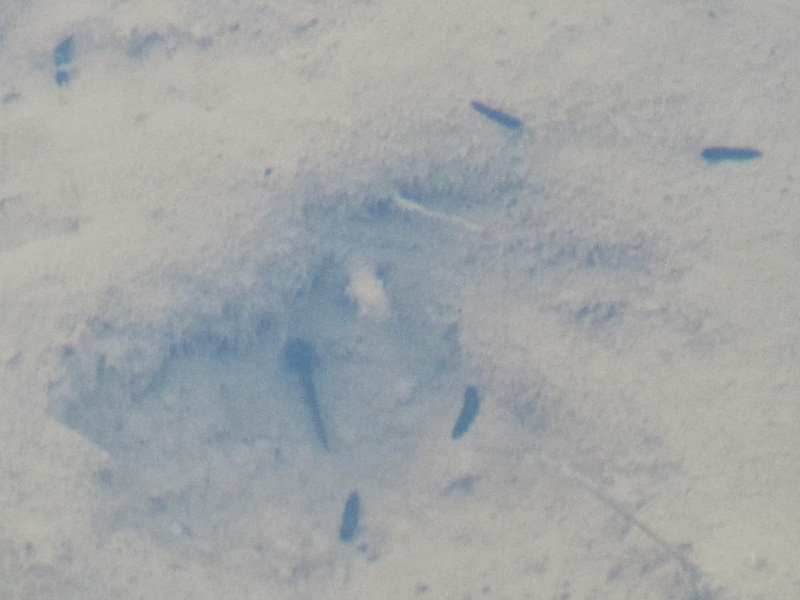 Even though there was still enough water to support life, predator tracks in the mud told me that the young salamanders and frogs could no longer survive in the pool. I netted the surviving pool larvae and moved them back to the pond. 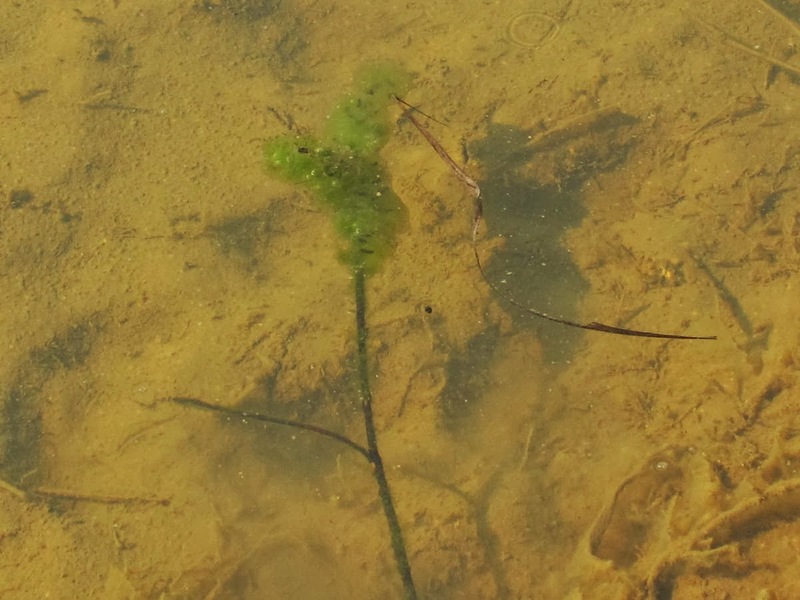 The dozen or so remaining salamander larvae would be independent of the water within a few days. 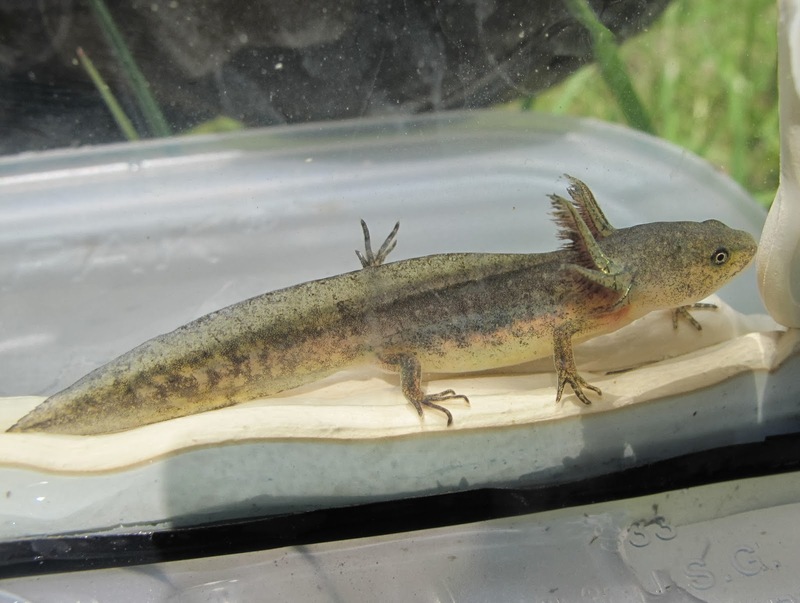 Knowing that salamander larvae survival is often quite low in typical breeding pools, I was happy with the number of pool raised individuals that made it to the land dwelling stage. The pool as of January 16, 2014. 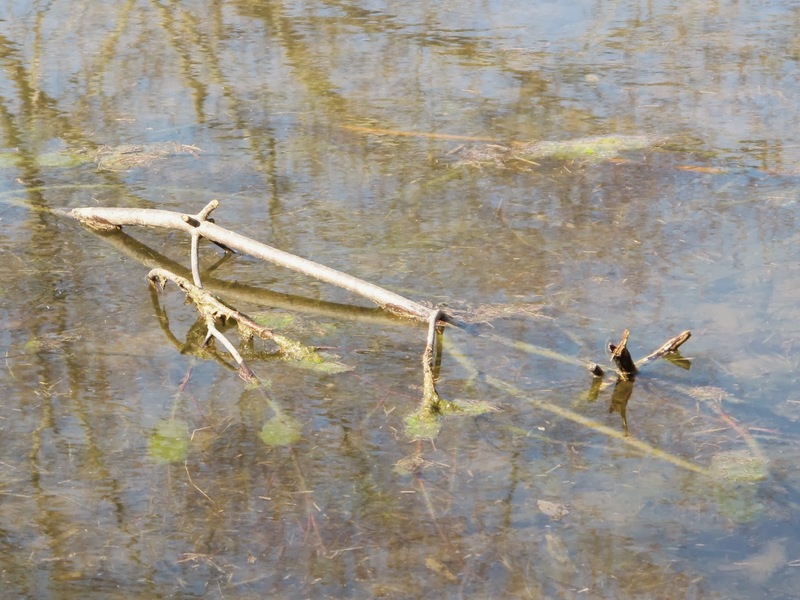 Vegetation has closed in around the banks and things are looking more hospitable for local aquatic creatures. So, why have I not mentioned the toads? Because there were none in 2013. I see toads occasionally through the summer, but I don’t know where they are breeding. If I don’t get toad eggs this spring, I may have to corral those I find in the summer and make sure they meet at the right time next year.